* Robert J. McKnew - lodger, male, white, age 24, single, born North Carolina, parents born North Carolina/North Carolina, can speak English, superintendent, works at food company, a wage earner, can read and write. 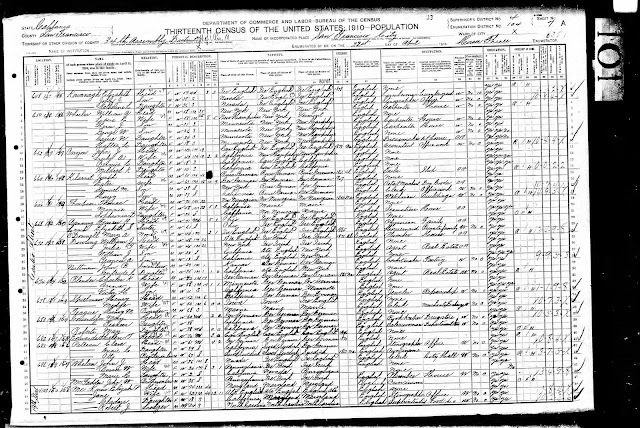 1910 United States Federal Census, San Francisco County, California, population schedule, Assembly district 34; Enumeration District 128, Page 7A, Dwelling #150, Family #158, Elijah P. McKnew household, online database with digital image, Ancestry.com (http://www.ancestry.com : accessed 28 May 2012); citing National Archives Microfilm Publication T624, Roll 98. 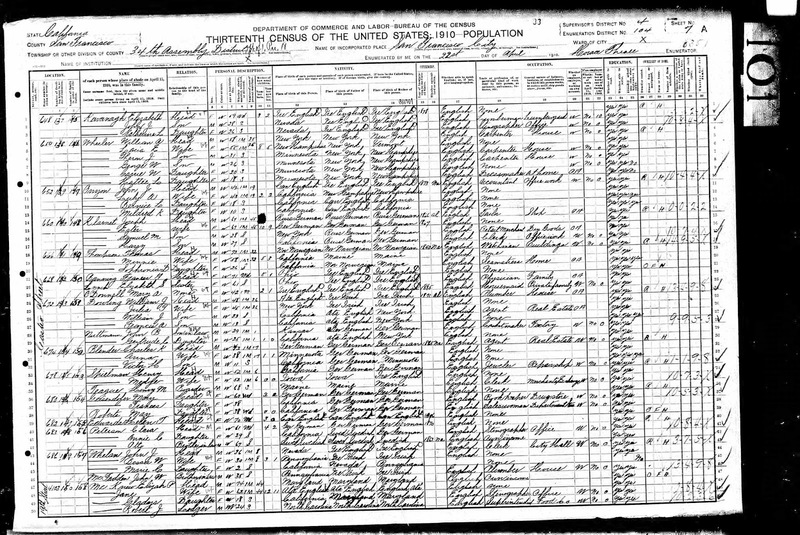 In the 1910 U.S. Census, only daughter Gladys is residing with Elijah and Jane (Whittle) McKnew. The lodger, Robert J. McKnew, born about 1886 in North Carolina, is probably not as McKnew nor a relative of Elijah McKnew. There is no other record for this person with those criteria. He was probably given the McKnew name because the enumerator forgot to ask what his surname was. Elijah Pickrell McKnew and Jane (Whittle) McKnew are my wife's great-grandparents; her grandmother is Edna Catherine (McKnew) Schaffner (1884-1974), who married Paul Frederick Schaffner (1879-1934) in 1906 in San Francisco.